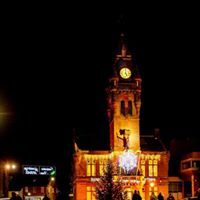 Dumfries and Galloway Council, the South of Scotland Economic Partnership, and the Scottish Government are delighted to announce the opening of our new designated development office in Annan. 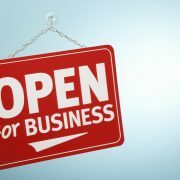 This new ‘Annan Solutions’ office opens for business on the 22nd March at Annan Business Park, Stapleton Road. The economic development office will provide support around DG12 to those starting or growing a local business, plus inward investment enquiries. As well as this, the team will assist with the implementation of the Annan Action Plan. The Annan Solutions team is seen as key to strengthening the Annan and wider DG12 community, building its resilience and future opportunities. To develop other potential business sites in the Annan and DG12 area. To work with local business to develop their growth potential. To work Bhagat Holdings Limited to support their growth and employment aspirations. To consider the wider economic impact for the community in Annan and DG12 as the result of jobs losses from Youngs closure. This team will take forward the delivery of an action plan towards ensuring the sustainability and resilience of Annan and the wider DG12 area. “The Annan Solutions Team will be officially revealed on Friday 22 March from their base in the heart of the DG12 area, however some of the Team Members have been in place for over 6 months and were at the centre of successfully securing the £9M investment and 120 jobs by Bhagat Holdings Limited at the former Pinneys Site in Annan. 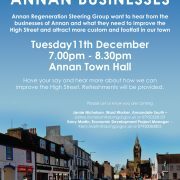 “Working with the Annan Regeneration Steering Group and the existing Annan Masterplan, the Annan Solutions Team will continue to support and advise ex Pinneys employees who are still unemployed, work to sustain and grow existing DG12 businesses, attract inward investment by encouraging new businesses and new economic opportunities into the DG12 area, breathe new life into Annan High Street by tackling empty shops and regenerate Annan by bringing derelict properties such as Albert Hall, Central Hotel and Erskine Church back into use. Having flown in from Australia on the morning of the first concert, flautist Stephen Clark really was a “Super Man” in his delivery of a spectacular recital with pianist, Ashley Beauchamp. 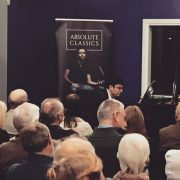 The pair gave four varied concerts that took inspiration from all over the world, linking the famous flute repertoire with arrangements of violin works and new and vibrant contemporary compositions. The duo enhanced the performances with witty repartee that made the concerts completely accessible for all those attending. On Friday morning, Stephen and Ashley generously gave their time in support of Absolute Classics’ education programme and worked with over 150, S2 & S3 pupils at Annan Academy. As you are all aware the tree has been causing lots of problems in this area for months now ( never mind the tree what about the barriers) the roots have been lifting the paving slabs therefore causing a slips trips and falls hazard. In desperation I think a solution being thought about is to replace the tree and use a tree pit to curtail both growth of tree and more importantly roots. What do you all think remembering in this day and age health and safety is paramount – would a tree seat help covering up some slabs.